EDWARD Trippel walks a thin line in trying to balance the needs of commercial fishermen with the safety of marine mammals. The research scientist for Fisheries and Oceans Canada’s Aquaculture Division in St. Andrews, New Brunswick, is helping develop and test new types of fishing gear intended to keep in targeted fish and keep out bycatch such as harbor porpoises and whales. He’s a natural choice for the job. Trippel honed his skills as a fisherman while summering as a child and teenager on Georgian Bay in Lake Huron, Ontario. As part of his research at the University of Toronto, from which he holds bachelor’s and master’s degrees, he studied the effect of acid rain on fish in lakes. The first paper he published was on a small, collapsible plexiglass fish trap he developed to capture live small minnows and fish to study. He also holds a Ph.D. from the University of Guelph in Ontario. His keen interest in fishing and the welfare of fish persisted as he moved from fresh water work in lakes to the ocean in Atlantic Canada. “I was involved in stock assessment for groundfish in the Bay of Fundy, and saw harbor porpoises caught in fishing gear,” he said. He saw this as an opportunity to work with marine mammals and turned his focus to fishing gear. “I could communicate well with fishermen from my fishing experience and understand environmental issues,” he said. Trippel was one of a team of three that was a runner-up in the World Wildlife Canada’s International Smart Gear Competition in 2005. The prize was for innovative research to increase the reflective properties of gillnets and to design weak rope that can reduce the incidence of bycatch of porpoises and whales in commercial fisheries. Trippel worked with fellow winners Dr. Norman Holy, a chemist at Atlantic Gillnet Supply Inc. of Yardley, Pennsylvania, and Don King, a fisherman from Gloucester, Massachusetts. Holy invented a gillnet laced with the chemical barium sulfate, which stiffens the net enough to better reflect back the sound waves to echolocating porpoises and alert them to a potentially dangerous obstacle. He also invented a continuous weak rope that will break more easily if a mammal gets entangled in it. Trippel tested the gillnets for three years in the Bay of Fundy with the help of King and the Grand Manan Fishermen’s Association. The result was a significant reduction in the bycatch of both harbor porpoises and seabirds that get entangled as they dive for the fish bits still stuck in the gillnet after it is emptied. The birds may be able to see the new nets better than the traditional transparent nylon nets, because the nets are dyed blue or green to cover the bright white of the barium sulfate in them. “We wanted to have something that was easy for the fishermen to use and that would be cost-effective,” Trippel said. Before the barium sulfate nets, fishermen had been using nets with acoustic alarms or “pingers” on them since the 1990s. The pingers sound an alarm at 10 kilohertz every 3 to 4 seconds. The alarms have been effective in keeping the animals away, but they are expensive. They must be maintained and batteries replaced, and there was concern the porpoises might get accustomed to the noise or be displaced by it. Trippel said there also were compliance issues in getting fishermen to use them. Research on the gillnets led to development of the continuous weak rope, which contains barium sulfate and is dyed purple. It is used for the floatline at the top of the gill net. The weak rope breaks at 1,100 pounds, or about 50 percent of the normal breaking strength of 2,000 pounds, allowing whales to break free from it. It is being considered in both the gillnet and lobster fisheries. There were about 89,700 harbor porpoises in 1999 in the Gulf of Maine, Bay of Fundy and northern Georges Bank areas, according to National Oceanic and Atmospheric Administration figures. 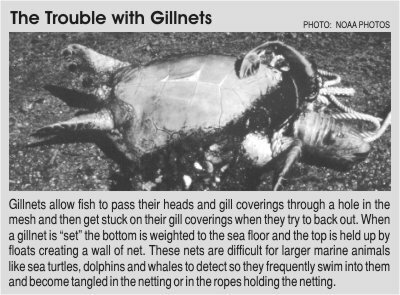 Deaths due to commercial fishing gillnets were 425 in the United States from 1999 to 2000, and 23 in Canada from 1996 to 2000. Traditional gillnets form a wall of netting that is kept vertical by a line on top, the floatline, and a weighted rope on the bottom, the groundline. When a fish enters the net it is caught by its gills, hence the name gillnet. Smaller fish can get through the nets unharmed, but porpoises, dolphins and whales are at risk for becoming entangled in the net, the groundline or the floatline. While Trippel said it still is not clear why the barium sulfate nets work, it could be because stiffer nets are less likely to get tangled around a fin, teeth, flipper or tail. The nets also are more acoustically detectable for mammals using echolocation. 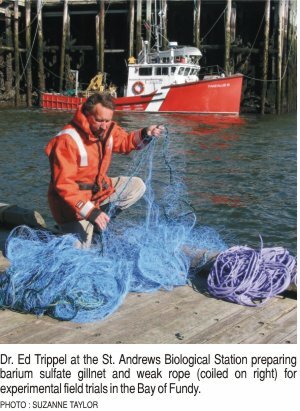 The nylon nets contain 3 percent barium sulfate by weight and 10 percent by volume, so they are a bit heavier, but Trippel said fishermen seem willing to use them. The barium sulfate nets cost 10 to15 percent more, but they last longer than nylon-only nets. “Every fisherman would rather have a simple solution without batteries and sound,” said Trippel. He added that barium sulfate has no side effects in the environment. Trippel and his colleagues continue to test the nets and experiment with new concepts. One such concept they applied last summer was a net that emitted a light green glow so the mammals could see it underwater when they weren’t using echolocation. But the nets were effective in an unwelcomed way: they kept everything away. “The fishermen thought it was odd to see nets glowing on their ships,” Trippel said. “And they didn’t catch much of anything in the nets. No fish or bycatch.” Trippel said that while some other researchers may find a use for the glow technology, his group is focusing on the barium sulfate nets and testing them further.